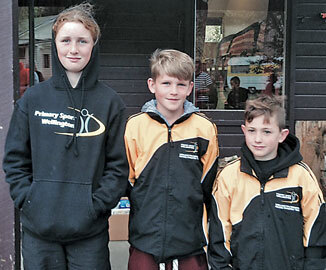 Local primary school children distinguished themselves in the recent Inter-Regional Cross-country championship meeting held at Hanmer Springs. Fletcher Carpenter, 9 from Waitohu , Oakley Fearon, 10 from Waikanae and Hala Graham 11 from Manakau school, pictured below had to prove themselves to be selected for the Wellington Cross-country team. They did so by winning in Otaki and Levin, coached by Paul Carpenter and Peter Ellis. The Wellington team beat teams from Canterbury, Tasman, South Canterbury and Bay of Plenty. There were over 350 children competing. The Otaki team cam home with the Phil Costley Shield and some very proud parents.